I'm knee-deep in my current novel. It feels like the edits are endless, and sometimes I revise myself into pretty interesting situations. It's my first go at editing a novel, and I'm racking up experience points and brain bruises pretty quickly. Sometimes, when it's disheartening, I take a step away. And then I slam my head on the wall. And then I run to my readers and complain. And weep. And then I turn around and face everything I've ever known and ever loved--the books I cling to when I need a story. When I need a new world. When I need hope. Those same books which pushed me towards writing to begin with. And I sit there with them. With the characters. I fall into the story and experience all of the love and sadness and pain right along with them. While I was working one day, I thought to myself, "Why am I so drawn to this story? Why is my heart so attached? Why do I cry during this part... and why do I want to BE there for that part?" 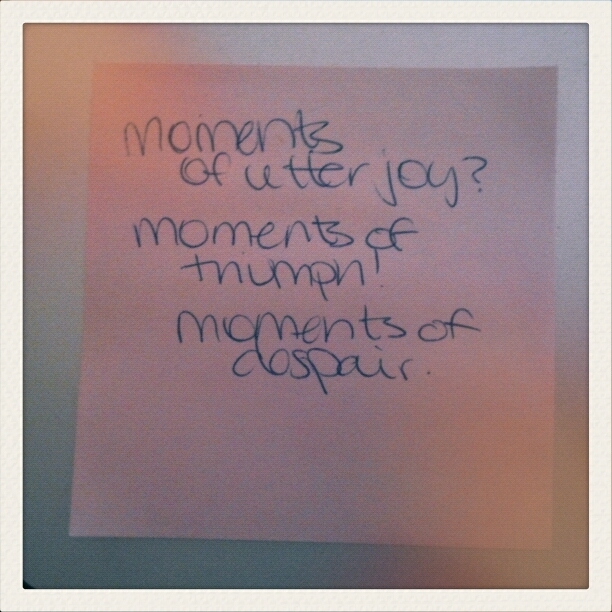 And then I scribbled on a post-it note. It's those moments. Each of them separately and each of them paired together. Not glimpses of happiness or an underlying feeling of goodness throughout. The sharp points a reader doesn't expect but so desperately wants. The spectrum is huge. I only wrote three, but there are so many more. But what I'm drawn to--what I cling to--are these three things. In any order. And repeated. I went back to my own novel and realized it was pretty... muted. Like the flat horizon line on the ocean. The feelings were happy, cheerful, sad, distraught... everything we feel but everything that isn't particularly memorable. My story didn't have that punch. My character didn't have her moment of utter joy. And this character? She needs it. She needs it like I need it. It'll get there. I'll add that punch. Great thoughts, Aun-Juli. Probably what you're discovering in your work (needs more punch, needs more passion) is a very common thing for a writer to discover after they've drafted a story and truly analyzed it. I say that, because I'm going (and have gone) through the same thing. It's all there. But it isn't. Kind of like cooking a perfect soup with all of these delicious veggies and ingredients. You know it's going to be awesome. It has everything you love in it. Yet when you taste it it's bland and lifeless. You realize you've left out the salt. You've left out the IT. Keep hammering on it and you'll get it into shape. I guess that's why it's so important to take a rest for a second when it's done and let it just sit. And let your mind forget. Because when you're in the ether of writing, it all seems so exciting at the time.